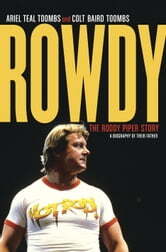 The biggest pro wrestling bio since Bret Hart's Hitman: legendary Rowdy Roddy Piper's unfinished autobiography, re-conceived and completed by his children, actress/musician Ariel Teal Toombs and wrestler Colt Baird Toombs. In early 2015, Roderick Toombs, aka Rowdy Roddy Piper, began researching his own autobiography with a trip through Western Canada. He was re-discovering his youth, a part of his life he never discussed during his 61 years, many spent as one of the greatest talents in the history of pro wrestling. Following his death due to a heart attack that July, two of his children took on the job of telling Roddy's story, separating fact from fiction in the extraordinary life of their father. Already an accomplished wrestler before Wrestlemania in 1985, Roddy Piper could infuriate a crowd like no "heel" before him. The principal antagonist to all-American champion Hulk Hogan, Piper used his quick wit, explosive ring style and fearless baiting of audiences to push pro wrestling to unprecedented success. Wrestling was suddenly pop culture's main event. An actor with over 50 screen credits, including the lead in John Carpenter's #1 cult classic, They Live, Piper knew how to keep fans hungry, just as he'd kept them wishing for a complete portrait of his most unusual life. He wanted to write this book for his family; now they have written it for him.